The following is the 13th message that we received in Avalon (England and Scotland) this past June/July 2012 over Solstice. You can find our other messages on our website at www.alunajoy.com under the "Articles for Personal and Planetary Transformation" link. It might be a good idea to read them in order as each message builds upon the previous one. We are sharing this message here with you just as we received it, in present time, with very little editing. We do this for a very important reason. We know that the messages that we receive are not just for our groups, but are for others as well. The Star Elders and all the others that joined us, assure me that the message and the corresponding energy will be transmitted to you as you read them. So as you read this, you might want to imagine that you are with us. Also, always view the photos on the website that we share, as photos also hold some energy of the sites. We visited the healing stone of Men-an-tol. Myth shares that when a person passes through the center of the stone a healing take place. So as a group, we decided for each of us to pass (east to west) through the stone while the group sang a song of blessing. The group held a healing space for each of the group as they made their passage through the stone. 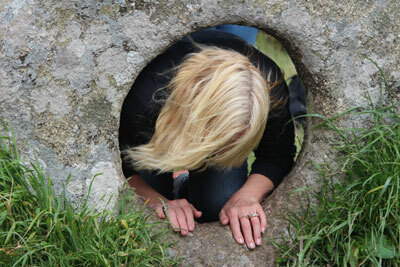 Once the group began to make their passages through the stone circle, I began seeing that this unassuming stone, in the middle of the English country side, was in fact connected to the whole world. I could also see that this stone had a higher calling at this special point in time, other than the stories that had survived in ancient myth. 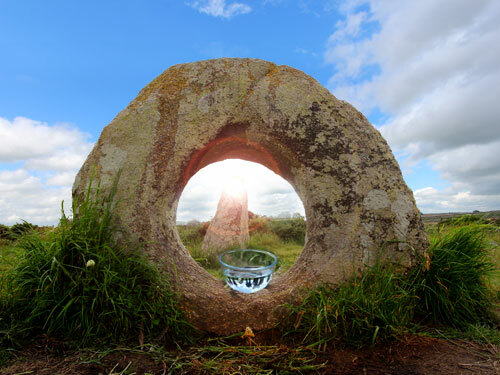 The healing stone of Men-an-tol is a place to be re-born; to clean the slate of the past, and to prepare for a new and brighter world ahead. As we worked with this ancient stone, we could see that we were sending rebirth, love and healing to the world as we asked for our own personal healing. Jeshua shared, "What one does for oneself, one also does for all living beings. We are all connected." As we made our passage, we were sending this energy to the world (and to those reading this). (P.S. I asked for the healing of my broken rib that healed miraculously fast). The Star Elders continually say that the space in between manifested form is where the real magic is . . . like the empty space within the cells of our bodies, the space between a breath in and out, the empty space between awake and asleep, all the way to the space in between the stars and planets. These are sacred and spiritually insightful places where the mysteries of the universal are held for us all to benefit from. When I came to Men-an-tol today, the Star Elders said I needed to make an essence that was created INSIDE the world. I didn't understand this until just now. (P.S. We made an Sacred Site Essence here this day.) The void spot in the center of the Men-an-tol stone IS the world, and it is the awakened self within us. Passing through the stone activates this memory. It is always important to ask for personal healing. Servers of the Light usually forget to ask for themselves, as they are not personally or ego driven. So today . . . right now (and those reading this), ask for your healing; because if we are not healed, we cannot be effective servers of the light. When we are not healed, we are working with a diminished energy field and only can help partially in the outside world. When we ask for healing for ourselves, we can begin to heal completely. BUT . . . the Star Elders also share, "Just because you are not healed 100%, don't stop helping others." Don't wait for that moment when you are whole and totally awake to be of service. No one on Earth is completely healed or completely awake. If you are in a human body, you have unresolved issues and things to heal and things to learn. The way to illumination is to give and share what you know for sure . . . today. Your knowing will evolve from day to day. But as we help each other in the best ways we know, we build an evolving stairway to a place where we can all be whole and well 100% together as one. The Star Elders add . . . "We are near the end of this long journey to illumination." When we feel the frequency of Men-an-tol, it generates an crucial clean slate we need in order to be able to pass into the new world. Because we are all connected, as each of us is reborn and embodies a clean slate, all life and the world is affected positively. Because of this action of service we are giving back to the rest of the world, and all of you (and those reading this) are now carrying this energy with you.